Overview - A career officer (Jones) and his wife (Sarandon) work with a police detective (Theron) to uncover the truth behind their son's disappearance following his return from a tour of duty in Iraq. Paul Haggis is one of the more polarizing filmmakers working in Hollywood today -- he tackled racism in 'Crash,' euthanasia in his screenplay for 'Million Dollar Baby,' and, most recently, post-war trauma with his Oscar nominated 'In the Valley of Elah.' To be fair, nearly every wartime drama was unfairly ostracized in 2007, but Haggis's quiet procedural managed to offend conservative sensibilities and get labeled in some circles as "lefty propaganda." 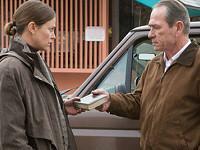 Tommy Lee Jones plays Hank Deerfield, a Vietnam vet and former military police investigator, who gets a tip that his son Mike (Jonathan Tucker) has returned from Iraq and gone AWOL. Hank packs up his truck, kisses his wife (Susan Sarandon) goodbye, and heads for New Mexico to find Mike before he can be dishonorably discharged from the military. However, a simple search for his son soon leads him to a group of soldiers with something to hide, a commanding officer (Jason Patric) desperate to keep the investigation in-house, and a less-than-enthusiastic police chief (Josh Brolin) looking to keep his crime stats down. With the help of a shunned detective named Emily Sanders (Charlize Theron), Hank sets about uncovering what has really happened and finding out why everyone is so intent on keeping it a secret. Personally, I didn't find anything offensive about 'In the Valley of Elah.' I simply think it's a particularly effective character study that might drift a bit too close to some viewers' comfort zones -- it offends by its proximity to controversial subjects (Post Traumatic Stress Syndrome, torture, drug use, abuse of power etc.) rather than through a deplorable message regarding these subjects. For all of the accusations leveled at the film for being an attack on the war, the current administration, or the military, I thought it was simply an examination of the frailty of human nature. Haggis focuses his criticism on a system that uses a group of soldiers for war, then abandons them the minute the battle is done. He asks his audience, "What about the ongoing psychological side effects? What about the ongoing impact such a violent experience will have on their home lives? What about their families, friends, and communities?" The film is anchored by Tommy Lee Jones' performance, and it's easy to see why such a divisive film still scored the legendary actor an Oscar nomination. The scenes between Jones and Sarandon are powerful, to say the least, and quite literally brought tears to my eyes. Even separated by distance (her character is stuck in Tennessee for all but one major scene), their phone conversations and individual reactions tore me apart. Each time Jones shared the screen with another performer, the movie soared. While his character's gruff exterior seems to rub everyone the wrong way, we're given a few, simple glimpses into his inner turmoil that allow us to understand how poignant and authentic this aging Everyman actually is. Unfortunately, when Jones isn't the center of attention, the film tends to slow down dramatically and lose its momentum. I also found myself disappointed by the predictable answers waiting at the end of Deerfield's investigation, by the deflating reaction Deerfield has to the truth, and with the overall anticlimactic conclusion to the mystery. 'In the Valley of Elah' sets the stage for a startling revelation, but provides an ending that's as ordinary and boring as I could possibly imagine. Despite the excellent performances, the film collapses during its third act. An especially pitiful closing scene is the only truly offensive part of the picture -- not because it does anything controversial, but because it's so contrived and eye-gougingly sappy that I couldn't believe it was attached to the film I had just watched. 'In the Valley of Elah' is an actor's film, full of great performances and resonant scenes that will stick in my brain for some time. Sadly, the story can't maintain its own promise, fizzling out when it should have ended with a bang. Considering the fact that Haggis fans adore his third act gut-punches, I was surprised to feel so little when the credits rolled. For all of my emotional investment in the first two acts, I felt nothing in the end but the sting of hollow disappointment. Like its identically encoded Blu-ray counterpart, I doubt the HD DVD edition of 'In the Valley of Elah' will turn any heads. However, its 1080p/VC-1 transfer is a technical testament to Haggis's directorial intentions and considerably outclasses the standard DVD. The word "color" feels like a bit of a misnomer when discussing a film that completely strips its palette of primary vibrancy -- as it stands, the only element that isn't faded or washed out here is the American flag. Still, fleshtones are incredibly accurate (in spite of the natural lighting schemes) and contrast is, dare I say, perfect. Detail is also impressive considering the shadowy nature of this procedural. I caught every crease in the military uniforms, was able to read the smallest words on cluttered paperwork, and could literally count the budding whiskers on Tommy Lee Jones' wrinkled face. Better still, black levels are strong, and the frequent nighttime shots aren't hindered by crushing, noise, or artifacting. If the image lacks anything, it is consistent clarity. While this is most likely the result of the 35mm stock, several shots are conspicuously soft compared to the rest of the film. While it never feels out of place with the cinematography and the frequent, low-res videos Deerfield watches via e-mail, these hiccups managed to distract me from the overall quality of the transfer. 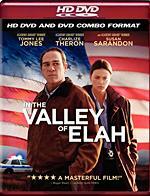 In the end, 'In the Valley of Elah' is a fine looking high definition release that makes its DVD counterpart irrelevant. Haggis fans will be more than pleased with the results and will likely refer to the errant softness as "filmic." Although 'In the Valley of Elah' is a quiet, conversation-driven film, it provides an excellent opportunity to realize the countless, subtle luxuries that a proper, uncompressed audio track can bring to the table. Take a moment and compare the Dolby TrueHD 5.1 surround mix (48kHz/16-Bit) to the standard Dolby Digital Plus 5.1 track (640kbps) -- dynamics are more robust, ambience is more defined, and dialogue is more stable. Sure, the standard audio is decent and does its job well, but the high-end mix simply creates a more believable space for the film to inhabit. The TrueHD track is home to crystal clear dialogue that sounds natural and unprocessed -- regardless of the locale, prioritization is spot-on and shifts between the sorts of authentic environmental acoustics I'd expect when characters move from a dusty police station to a morgue or military base. LFE support is prevalent throughout the experience and builds a firm foundation for each element in the soundscape. 'In the Valley of Elah' is by no means a bombastic actioner, but it does have its fair share of standout low-end pulses. Add to that a particularly thrilling car chase that takes momentary advantage of the rear speakers and it becomes clear that the sound designers took their time in several key scenes. If I have any nitpick, it's that the film still rests on its laurels in the front channels more often than it should. The immediate soundfield may be convincing, but it lacks depth and distance when it comes to the rear speakers. When Deerfield and Sanders survey a murder scene late at night, where are the sounds of the nearby military base, the buzz of the street lights, or the rustle of the underbrush in the wind? Minor elements come and go depending on the scene, holding this TrueHD mix back from its full potential. Moviegoers who thought 'In the Valley of Elah' was a preachy bore will find themselves equally embittered by its slim and serious supplemental offerings. While it ports over all of the features from the standard DVD, the package doesn't try to be objective and tends to pound its point home. What this controversial release really needed was a thorough commentary that allowed Haggis to address the film's criticisms and his perceived directorial agenda. After Iraq and Coming Home (SD, 43 minutes) -- This two part documentary digs into Haggis's adaptation of the news story that inspired 'In the Valley of Elah,' and explores real life stories from soldiers who've returned from the battle field. It gets a tad repetitive at times, but it ultimately complements the film with a heart wrenching look at the unavoidable side effects of war. The best bits were interviews with some of the supporting actors -- to my surprise, many of them are actual soldiers and veterans who were determined to portray their brethren with dignity and compassion. This is a candid, fly-on-the-wall perspective, and I was intrigued by every minute. Additional Scene (SD, 6 minutes) -- Despite its singular title, this is actually a collection of half a dozen deleted scenes that really should have been left in the film. Their inclusion certainly wouldn't have improved the film's pacing, but the cuts would have expanded the characters and provided a more intimate glimpse into Deerfield's emotional turmoil. 'In the Valley of Elah' solidifies director Paul Haggis' reputation as a polarizing filmmaker who splits audiences and critics with his controversial subjects. Unfortunately, the most polarizing aspect of this film hinges on its inability to maintain its power. This HD DVD release fares a bit better, with a decidedly strong video transfer and TrueHD audio track. The only real downside is that the disc isn't packed with more revealing supplements. At the end of the day, this film is likely to provoke a variety of reactions -- some people will find it mesmerizing, some will find it offensive, and others will find it wholly unsatisfying. Give it a look and see where you fall.